Every season is hiking season with unique beauties in California and early spring’s magic is the wildflower bloom. It starts as early as January and it’s over by April – at least at lower elevations (we definitely don’t think of the Sierra Nevada which is mostly covered by snow even in April). Also, early spring is your last chance to see the lush green California. If you miss it, you have to wait until next winter as the landscape becomes rather brownish and yellowish than green by May and it will remain so until the first winter rains. Here’s some ideas when and where to go for wildflower hunting. 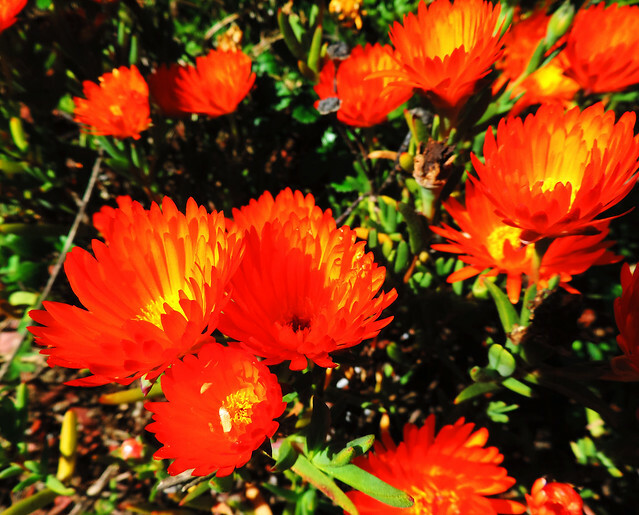 Southern California’s wildflowers are the first to bloom. 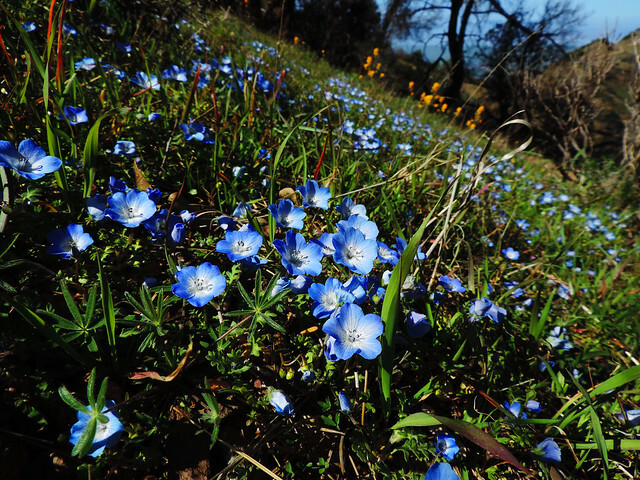 The extent and timing of spring wildflower blooms vary from one year to the next, but it can start as early as January. Anza-Borrego Desert State Park said to be the most spectacular though the blooming is very short. Joshua Tree National Park’s wildflower bloom usually starts around February at lower elevations and in March and April in higher elevations. Unfortunately, we haven’t been so lucky to see them yet, but we just can’t miss them out from this list as it would feel so incomplete (well, in fact, it is). We haven’t planned our travels based on the wildflower bloom but if you really want to see it it’s worth checking all the online reports about current conditions in the parks (just like this one) because it’s easy to miss it. Even the extremely hot Death Valley can be full of flowers for a short period of time if conditions are met. Though blossoms are never totally absent it’s rare that conditions are just perfect for a colorful bloom. If we would be there that year and that time though… It could be such a unique experience! 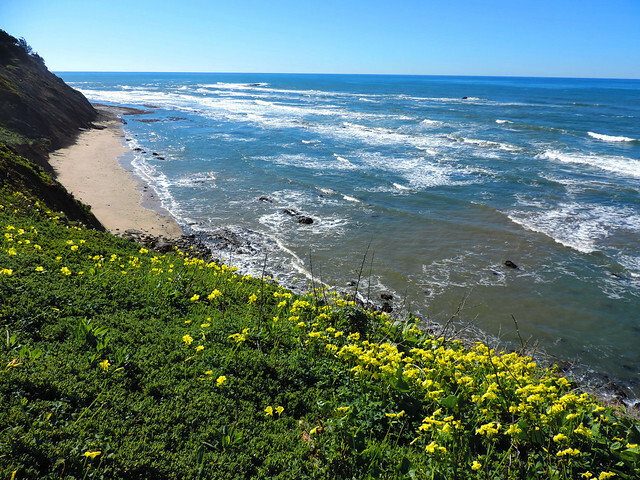 February and March is the usual time for wildflower bloom on California’s ocean coast. 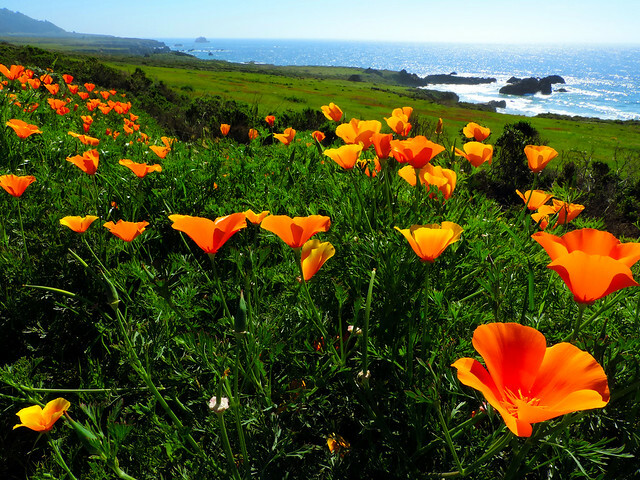 The lush green hills become rather vivid orange at some places as millions of California poppies are in bloom! Big Sur was one of our favorite coastal hiking place anyway and it hasn’t disappointed us with its wildflowers either. Andrew Molera State Park or Julia Pfeiffer Burns State Park have charming shorter and longer hikes but any of the coastal bluff trails could also be a good choice for a beautiful wildflower walk. 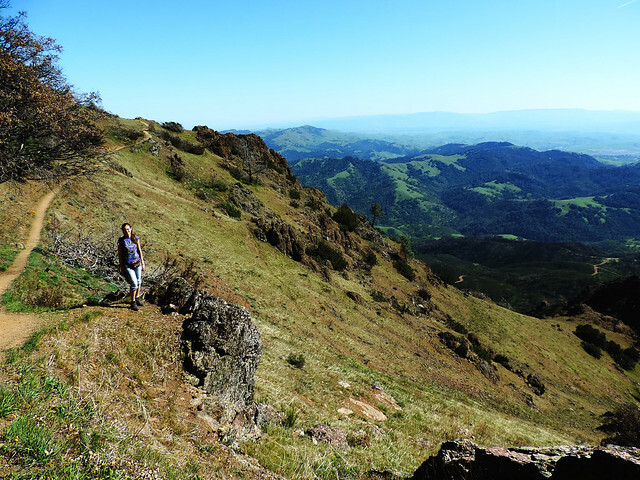 Hiking in Mount Diablo State Park in the beginning of March was our most beautiful and colorful wildflower hike in Central California! The variety of wildflowers there was amazing all the way during our hike to Mount Diablo Summit. It’s a steep hike but it rewarded us with a nice panorama – in addition to the wildflowers. This preserve is right behind the wild and beautiful Pescadero State Beach and it’s worth a visit not only because of the wildflowers but also because it’s an excellent place for bird-watching. About 200 species of birds have been recorded in the marsh and more than 60 nest there, too – for example the Great Blue Heron. Both spring and summer feature a broad spectrum of wildflowers in the marsh and on the beach bluff trail. Wildflowers have already been in bloom when we visited it at the beginning of March last year. And by the way, just walking on the beach is a lovely romantic addition for couples and sentimental dreamers. 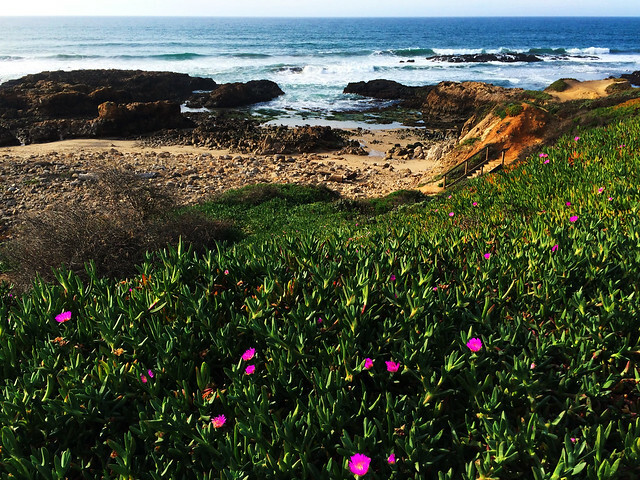 Half Moon Bay State Beach and the nearby beaches and coastal trails are often referred altogether as Half Moon Bay. They offer several shorter coastal trails and the chance to see wildlife there is pretty good. 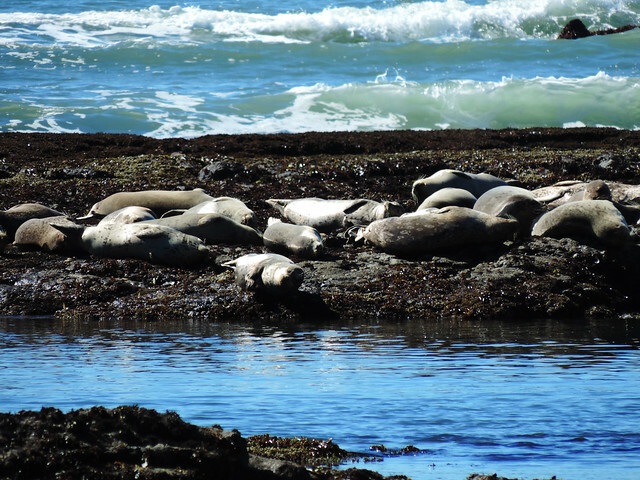 We’ve seen a bunch of seals both around Moss Beach and Pillar Point Bluff. 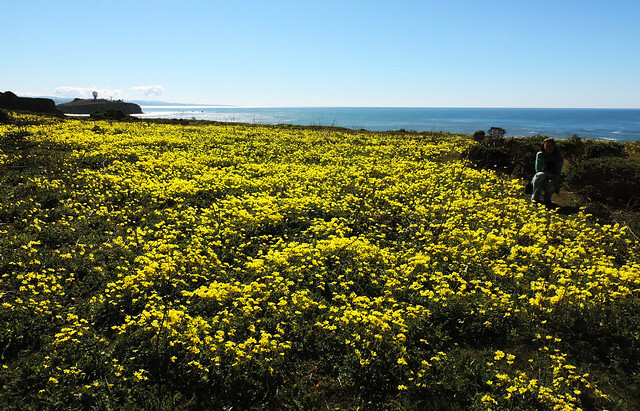 The loveliest wildflower trail was probably Pillar Point Bluff Trail south of Moss Beach. We’ve been there at the beginning of March and you better plan your visit in early spring, too, if you want to see a lot of flowers. 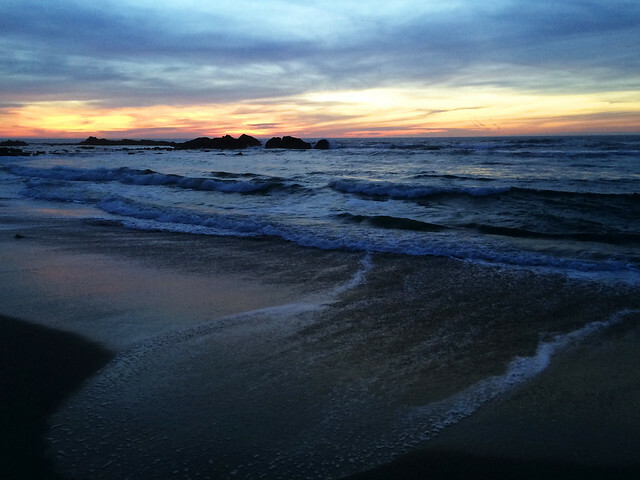 Our favorite hidden gem in the area is Cowell Ranch State Beach which is accessible by a short trail. It’s very well hidden but Google Maps has given us a pretty good clue where we should start looking for it and there’s a small parking lot by a yellow gate which indicates the trailhead. The beach itself is north of the bluff trail and it’s accessible by wooden stairs. There’s a beach south of the bluff trail, too, and it’s definitely worth taking a look at it because it’s a seal preserve (for that reason it’s not accessible). Even though we’ve hiked a lot in California, especially in Central California, we are pretty sure we missed a whole lot of amazing wildflower hikes. So what are your suggestions? Don’t hesitate to share away! We’ve started this series to show you our favorite California hikes for all the seasons. You can get ideas for the best late spring, summer, autumn and winter hikes, too.